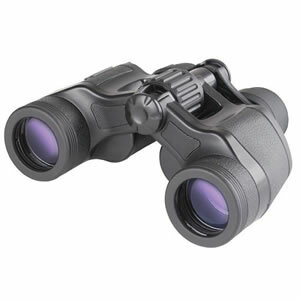 The black 7-15x35 Mirage Zoom Binocular from Meade features a porro prism optical design with anti-reflection fully multicoated optics that maximize the light coming into the user's eyes, and offer bright and clear views. A wide zoom range from 7x to 15x provides observation options for medium to long range subjects. Its aluminum housing is covered in a rubberized armor to help protect it from drops and impacts, while the fold-down rubber eyecups make it comfortable to use with or without eye wear. For long-term glassing, it can be mounted on tripod using an optional adapter. 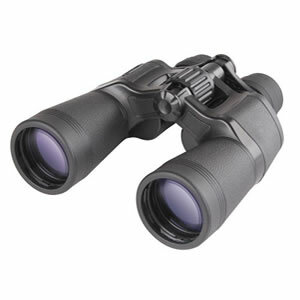 The black 10-22x50 Mirage Zoom Binocular from Meade features large objectives and a porro prism optical design that offer bright and clear views with a rich depth of field not normally seen in comparable roof prism binoculars. Its 50mm objectives provide enhanced low-light ability compared to smaller objectives. Complementing the objectives and prism configuration are anti-reflection fully multicoated optics that maximize the light coming into the user's eyes. A wide and powerful zoom gives the user a range of observational options not available in fixed magnification binoculars. Its aluminum housing is covered in a rubberized armor to help protect it from drops and impacts, while the fold-down rubber eyecups make it comfortable to use with or without eye wear. For long-term glassing, it can be mounted on tripod using an optional adapter.